Force Execution now occurs much more frequently throughout the fight instead of just near the end. There is one right at the start so melee DPS need to beware. Healing and DPS challenges are much more challenging. Operatives heals shine here due to their double cleanses which can remove the healing debuffs. Around 40% and below, Raptus now perform a Spinning Attack phase where he will chase random raid members. Anyone who get hit will most likely die. 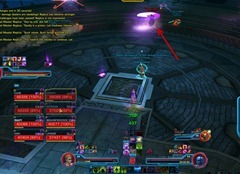 Previously in hardmode, Force Execution was reserved mostly for the later part of the fight. Now Force Execution will occur in all parts of the fight, including the very start. Healing and DPS challenge are considerably more difficult. Healing: In the healing challenge, not only is the NPC receiving much more damage, both healers also receive a debuff that reduce their outgoing heals by 90%. The NPC also receives a debuff that reduce their incoming heals by 90%. That is 3 debuffs you need to cleanse which make the healing challenge even harder. 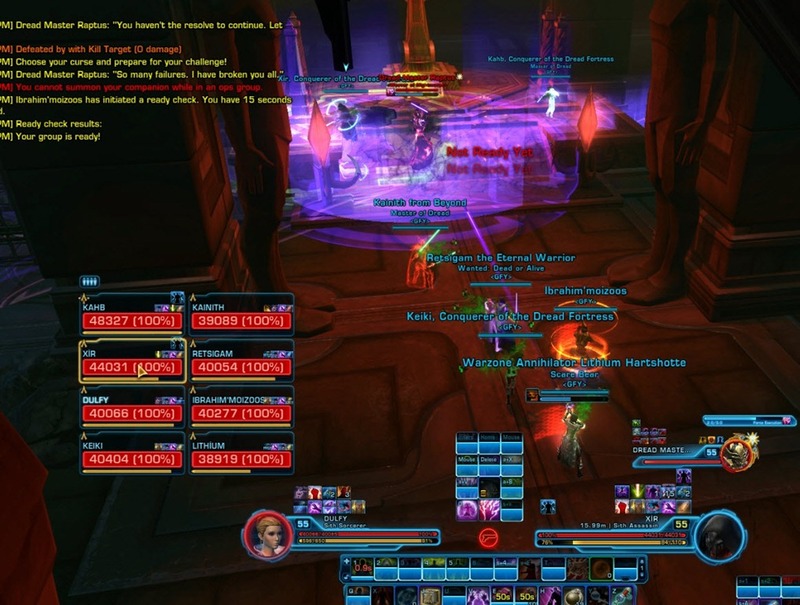 Operative/Scoundrel healers shine here as they can cleanse the NPC and then use Evasion to remove their own debuff. 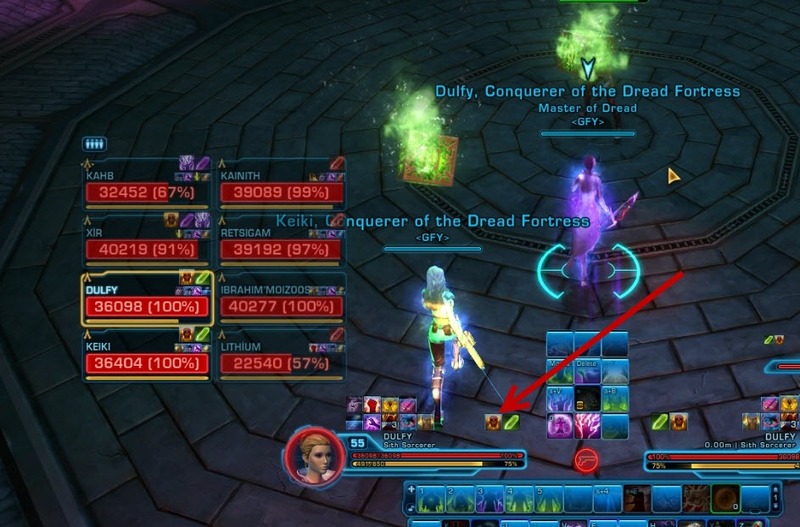 Sorc/sage healers can also do this for one healing challenge where they cleanse the NPC and then use Force Barrier to remove their own debuff (Force Barrier won’t be up for the 2nd healing challenge). Adrenals, Clicky Relics, and Bloodthrist/Inspiration helps healers with the first healing challenge greatly. If you have a mercenary/sorc healer combo, you may have to intentionally fail the second healing challenge as the cooldown on cleanse to come back up might be too long. DPS challenge have two target you need to eliminate. The right target is shielded initially so you will need to burst down the left one first before killing the right one. The fight is doable if you fail only one healing and/or DPS challenge. If you fail two of the same challenges, it might be a raid wipe. 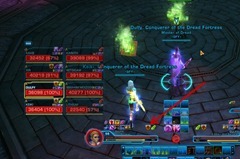 The tank challenge has a debuff (called "Curse of Proximity"; looks exactly like the Nightmare Power buff). This debuff is placed on the tank closer to the NPC and causes the damage in the challenge to tick for twice as much (about 2k on a maxed shadow tank). Note however that the damage in the challenge is no longer internal (as it is in HM and SM) but energy, which means it is subject to shield mechanics (making the overall damage taken only slightly higher than HM). The easiest way to clear the tank challenge and come out in a good place is to have one tank designated as the main tank. A shadow/assassin (particularly in hybrid) or a guardian/juggernaut works best due to cooldowns and mobility during Spinning Attack. The off tank should stand forward and take the debuff in the challenge with their cooldowns while the main tank guards them and just keeps their active mitigation up. A shadow/assassin in hybrid spec can use Blackout, a medpack, Cloak and if necessary Blackout a second time to further reduce damage without using major cooldowns; guardian/vanguards can use Focused Defense/Enraged Defense for lolvictory. Vanguards/Powertechs make ideal off tanks for this due to the 18 second duration on their shield, as well as their extremely high mean mitigation against force/tech+energy/kinetic damage. 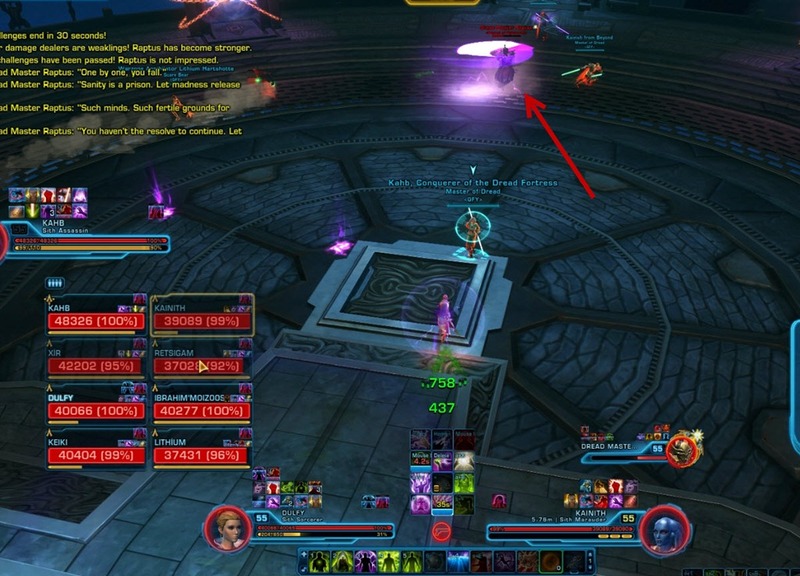 Without using cooldowns or going in with HoTs/bubbles, a shadow/assassin tank in hybrid spec with 46k HP will die from full health in the tank challenge if they have the proximity debuff the whole time, even with two tanks in the challenge. Past 40%, Raptus will enter several Spinning Attack phases in which he will spin around at a rapid speed and chase a random raid member. You need to run away from him during Spinning Attack as it is likely a one shot if you get hit by it. Predation can help if someone is having a hard time running him from him. Spinning Attack has a 3.0s cast so melee should watch his castbar and run away when you see him casting it. “Rocket boots! !” A fun way of escaping for stealthers I guess 😛 Never thought of it to stealth out and rocket boost something. How hard is the tank challenge, or is it the same as HM? The tank challenge has a debuff (called “Curse of Proximity”; looks exactly like the Nightmare Power buff). This debuff is placed on the tank closer to the NPC and causes the damage in the challenge to tick for twice as much (about 2k on a maxed shadow tank). Note however that the damage in the challenge is no longer internal (as it is in HM and SM) but energy, which means it is subject to shield mechanics (making the overall damage taken only slightly higher than HM). As another aside, Trauma Probe/Kolto Shell and Force Armor/Static Barrier both work perfectly on the dying captive (you can see Kolto Shell ticking in Zorz’s kill, and Static Barrier is similarly easy to verify). It just seems like they don’t work because the damage is insane. If you fail one of the healing challenges you will see the enrage within the last 15-10%, but if you don’t fail any challenges there shouldn’t be a problem. Hey Dulfy, why is there no guilde for NiM Bestia yet? And how long do we have to wait for a guide to Council NiM? I asked her the same question. Something tells me we won’t get an answer, and we won’t get a guide until AFTER the NiM Power Buff is gone. I don’t think she has a guild that’s cleared it yet for her to put the guide up, since Hatred’s group fell apart. Idk not that many amazing guilds would take her in my opinion. “guardian/vanguards” – u meant guardian/jugg, right? Hey Dufly, when is the Nim Dread Council guide coming? Just curious.